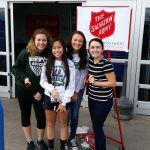 The RCSHS Girls Soccer team donated six hours on Saturday to ringing the bell at Walmart for the Salvation Army. The girls had a great time as the weather really cooperated (70+ temperatures) and helped raise a lot of money for a great cause. The last of the post season awards were named last Friday and Hannah Bandura, Emily Moore, Montanna Minor and Emilee DeMoss were named to the All Area team. The all area team consists of players from the 16th region, Lawrence County, Johnson Central and Paintsville. Senior Hannah Bandura was named to the 2nd team All State team and will be playing this Saturday at Boyle County. She will be playing against the west all state team at 2:30. Girls Junior Varsity Soccer, Girls Varsity Soccer · Nov 2 Lady Vikings well represented on All-Region teams. Girls Junior Varsity Soccer, Girls Varsity Soccer · Nov 2 Girls Soccer Ends Fantastic Season at State Quarterfinals. The Rowan County boys and girls soccer teams have peaked at the right time. Tonight both teams will play for the 16th Region Championship. If they win, not only will they advance to the state tournament, Rowan County will host a semi-state game. The girls play tonight at Bath County vs. Ashland Blazer at 7:00 pm.